As most of you “Witchees” already know, “The Witches of East End” returns for its second season on Lifetime this Sunday, July 6 at 9/8c. I spoke with series star Eric Winter, who plays Dash Gardiner, about what to expect this season from the show, and his character specifically. At the very end of the first season, Dash’s and his brother Killian’s warlock powers (which they never even knew they had) returned to them in full force when their mother died. The second season should be very interesting as the brothers hone and develop their magical powers. Celebrity Extra: First off, congratulations to you on your second-season renewal. I can’t wait to see what the show has in store for us. 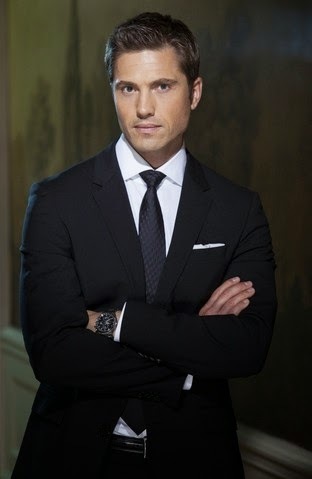 Eric Winter: Thank you! It’s so rare nowadays, it seems, to get a second season, with all of the other great shows that are out there. Everybody was happy to get back to work. We have a great group of cast and crew, so it was nice to get back and see everybody. CE: How was the return to work after the hiatus? Did you all just pick back up where you left off? EW: Yeah, we all just got right back on that bike. We all really like each other, and it’s a pretty smooth ride for the most part. Everybody was just happy to see each other, to reconnect, and it was good to dive into some new material. CE: Along with the new material, you’ve got some new cast members. EW: There are a couple of cast additions, which are good changes, but for me in particular, there is a massive change in character for Dash. I thought that my brother and I were very underused last year. And this year we are being used in a way that’s going to expand the cast we have and really propel the story. You’re going to get a nice, well-rounded cast and interaction of story lines now. For me personally, it’s a much more exciting role to play than last year. Dash really does a 180. CE: Another thing I am excited for this second season is 13 episodes, up from 10 from season one. EW: That was a nice little bonus. A little something to expand on some stories and dive into more stuff, and they give us a little longer to tell it. So that was actually perfect. CE: Now that you and Killian are aware of your warlock powers, that should be fun for you guys to play — it’s not just the ladies having all the fun. EW: That’s a huge bonus for us, that we have a lot more to play with and a lot more to explore. That’s been a major positive, as far as I’m concerned, when it comes to playing this character. I also think it added another level to our involvement, because now we are in the know with everything that is going on. Last year, we were definitely way out of the loop with what was taking place. And now we are in on the secret. It adds to the dynamics. CE: Last we saw Dash and Killian, Dash had left Killian for dead and set him adrift on his boat. How’s Killian going to feel about that? EW: That’s one of the things that will have to play out for the audience to see how that unfolds. But, if it were me, I’d be angry. CE: Dash is definitely not in control of his powers yet. Will we see him practicing and exploring? EW: His entire life, Dash didn’t know he had these powers, so now he’s in this new stage of exploration and trying to figure out how to harness the power. How do you control it and how do you access it? It’s much like what Freya went through last year. CE: Tell me about the addition of Ingrid and Freya’s brother, Frederick Beauchamp (played by Christian Cooke). EW: He definitely brings a nice, strong, edgy, young energy to the show, which is great, especially for the Beauchamp family. There’s a bit of tension between him and Aunt Wendy, and he’s also trying to form a relationship with his sisters. It definitely adds a nice layer to that family dynamic — having that male energy thrown in there out of nowhere, when they didn’t even know it existed. CE: This season’s tag line is “Darkness Is Rising.” Talk to me about that. Sounds a lot like Dash to me. EW: A big part of that darkness is, for sure, Dash, and that rise of power and what he’s ultimately trying to go after. It also encompasses his rivalry with his brother and everything else. There are obviously other issues that are going to be problems for the Beauchamp family that will continue to come out, and that has to do with the darkness as well. That tag line in general speaks to a danger that’s going to be within East End, but also within the Beauchamp family. CE: Can you give me a little teaser about what viewers can expect this season? EW: You are going to see a much darker and edgier show than last year. It will have a darker tone to it. Even the risks they take are going to be stronger and bolder, which I think the viewers will like. There’s a lot more conflict and danger than last year. Last year it took awhile for a lot of that stuff to play out. This year you’re going to see it happen much more often. CE: Everything you said about this season makes me very happy. EW: I’m glad you like it. It’s a fun show. I really think that the true fans of the show are going to enjoy the second season much more. That’s one thing that I can honestly say. Sometimes first seasons can be so good, but then the quality of the show goes down; they run out of ideas. But I think our story has only gotten better. It will please our current fans, and I think it is strong enough to draw in new fans. I think you will be very pleased. We’re back with guns blazing.